Home → Vet News → REALITY CHECK: The truth about fleas and your pets! It’s estimated that 70-80 million dogs and 74-96 million cats are owned in the United States; approximately 40% of all households have a dog, and 35% a cat. Wow! That’s a lot of fleas! Wait, why am I saying this? Well, let me cut to the chase: the truth of the matter is that we need to accept that we all have fleas in our home and back yard, even if we don’t own a pet! 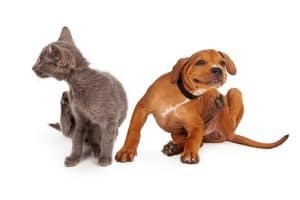 Fleas pose a medical problem to our pets and family, as they can cause allergies in our furry friends and transmit diseases, such as tapeworms (to dogs and cats) and Cat Scratch Disease (Bartonella henslea) to pets and humans. One of the most common myths is that if you do not see fleas on your pets they don’t have fleas. The adult fleas comprise only 5% of the flea population, leaving 95% of the flea life stages invisible to the naked eye. By the time we see fleas on our pet, it’s safe to say we have an infestation in our home. One of the most important factors in controlling fleas is to understand that the female flea can produce eggs (40-50 eggs/day) only when she eats a blood meal on your pet or other wild animal in the yard. Therefore, she needs your pet in order to keep the population going (the next generation will hatch in as little as 2 weeks). Use a veterinary-approved flea-control product on all pets in your household, so none of them maintains the population. Use the flea-control product all year round. 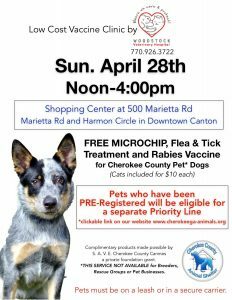 Not using flea control during the winter months (especially in Georgia’s mild winters) will restart or maintain the flea reproduction cycle, allowing new flea generations for later. The flea-control product must kill the adult flea or prevent/interfere with the insect’s growth, so that new eggs are not produced, or the ones that are produced are not viable. Some infestations may require treatment of the environment with professional pest control. The fleas that you see today hatched from eggs laid 3-8 weeks ago. Therefore, it may take this amount of time, or longer, to effectively eradicate the flea infestation. Veterinarians offer a wide array of safe and effective products that can help us achieve these goals. Some products are administered orally, while others are applied directly on the skin; some are used monthly, and one product lasts several weeks. Please consult with your veterinarian to find out which product best suits your pet’s and family’s needs. Let’s protect our family by protecting our pets! Dr. Wilmer A. Bustelo is a small animal veterinarian with 17 years experience. 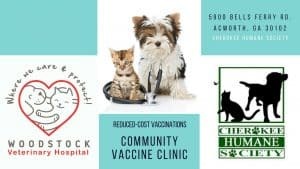 He and his wife, Dr. Maria C. Salazar, have owned Woodstock Veterinary Hospital since 2006. They have three small children and a Weimaraner, and live in Woodstock since then.